The pink mist lasted for a few hours. When it finally began to dissipate, the first person to become visible was Mistress Red-Dust. Her face was flushed, and a slight frown could be seen on her face. She seemed out of sorts, with mixed emotions in her eyes. After a moment, she looked over her shoulder at the fading pink mist, and then stamped her foot. That prompted a slight hiss of what might have been pain to escape her lips. Then, looking a bit shy, she turned into a beam of light that shot off into the distance. An incense stick’s worth of time passed, whereupon the mist faded completely away, revealing… a scene of complete chaos. Bai Xiaochun lay propped up against the trunk of a tree, staring listlessly into the sky, his face occasionally twitching. At this point within his bitterness, he finally began to feel a bit pleased with himself. Then he thought about the enchanting scene which had just played out, and his heart actually began to beat a bit faster. “Ah, whatever. I guess that will have to count as the explanation Zhou Zimo asked for.” Sighing, he began to collect all of his scattered items from the jungle around him. Then he got a new robe from his bag of holding, and made his way off. “Those Aphrodisiac Pills are really too dangerous….” This was his first time experiencing the Aphrodisiac Pill which he himself had created. Normally, he gave the pill to others to consume, but having done so himself now, he finally understood how terrifying it was. At the same time, his admiration for Zhou Yixing grew. After flying out of the jungle, he tracked down Song Que, who had been waiting nearby. When Song Que saw the flush on his face, and the wry expression he wore, he wasn’t quite sure what to make of it. Of course, he knew it must have had something to do with Mistress Red-Dust. And based on the way Bai Xiaochun looked, it didn’t seem likely that anything good had happened to him. And thus it was that Bai Xiaochun and Song Que flew through the mountains, drawing ever closer to the Deadmire. Another half a month went by, and they were in a very remote locale. Although they saw the occasional soul cultivator, the mere cultivation base fluctuations rolling off of them caused any such people to immediately flee. There were only a few savage tribes, who immediately dropped down to offer obeisance when they saw Bai Xiaochun and Song Que flying through the air. These remote border regions were actually where most savages tribes originated. Song Que even saw a few tribes that were clearly matriarchal in nature. The women of the tribe were extraordinarily ferocious and mighty, and also physically large. It was Song Que’s first time being in such a place and seeing things like this, and his gaze often lingered on the stunning things he was seeing. As for the savages, they viewed Bai Xiaochun and Song Que almost like gods. Before long, Song Que realized that Bai Xiaochun seemed to be lost in a daze most of the time. In his curiosity, he couldn’t help but wonder what had happened. Obviously, only Bai Xiaochun had returned from the fight with Mistress Red-Dust. “Don’t tell me he actually killed her?” The mere thought struck him with fear, but he didn’t dare to ask any further questions. The only thing he could do was be more on guard in case there were repercussions. And thus they proceeded onward, Bai Xiaochun in a daze, and Song Que on full alert. At one point when they were roughly four or five days away from the Deadmire, Bai Xiaochun suddenly stopped in place. Then, his blank expression turned into a curious one as he looked off toward a savage tribe located at the foot of a nearby mountain. It was a small, matriarchal tribe. Whether it came to the warriors in the tribe, or the other important people, they were all women. The men seemed weak, and were apparently kept only for reproductive purposes. The tribe wasn't very populous either. There were less than a hundred members, ninety percent of whom were women. The men all seemed gaunt and weak. Although they were big-boned like most savages, they seemed listless and exhausted. Most of them were gathered in one location in the tribal lands, where they lay quietly, occasionally chatting with each other. Some distance away from them was a stack of hay bales. Leaning up against them was a man who was clearly not a savage. He looked more like a soul cultivator. However, he was clad in a grass skirt, and was incredibly weak, little more than skin and bones. He clearly hadn’t bathed in some time, and lay there staring at the sky with listless eyes, seemingly resigned to his fate. As soon as Bai Xiaochun caught sight of him, his jaw dropped. Song Que gasped in incredulity. Although Bai Xiaochun had asked Bai Hao to help track down the other Heavenspan cultivators who had been teleported into the Wildlands, the truth was that Bai Hao had only just succeeded as the Hell-Emperor, and could not fully wield the powers of the Underworld River. Tracking down all those cultivators was not something he could easily do in a short time. “It really is Master God-Diviner!” Bai Xiaochun said, smiling. He immediately flew over to the tribe, followed closely by Song Que. Within moments, they were in the air over the tribe. Of course, the savages were immediately thrown into a frenzy. They all scrambled to offer obeisance as if to gods, including the many burly and rather ugly females. It was an interesting and unique tribe, but it didn’t take long for Bai Xiaochun to identify one female savage as the leader. Based on the fluctuations rolling off of her, she was comparable to the Core Formation stage. When Master God-Diviner’s previously listless eyes came to rest on Bai Xiaochun and Song Que, a tremor ran through him, and his eyes widened. Seemingly worried that he might be hallucinating or dreaming, he rubbed his eyes, then looked back. At that point, he leapt to his feet. The savages were shocked, and Bai Xiaochun was delighted. Waving his hand, he caused Master God-Diviner to fly up into the air. As for the savages, they trembled in reverence, and didn’t dare to do anything to hinder him. “You’re finally here!! I… I almost went crazy! Heavens! Is this really happening? I divined some time ago that people would come to rescue me… I've been waiting for years and years. I thought I wouldn’t be able to hold out until you got here….” More tears of excitement welled up in Master God-Diviner’s eyes as he chattered on. Close up, it was possible to see how terrifyingly gaunt he had become, to the point where bones were visible everywhere beneath his skin. Bai Xiaochun was deeply shaken by the condition Master God-Diviner was in. As for Song Que, considering that he and Master God-Diviner were both from the Blood Stream Division, his face turned particularly grim. Then he turned toward the savages, and seemed about to take action, when Master God-Diviner hurriedly got in his way. “Let them be…. Many of them are my own blood.” Years ago, when Master God-Diviner had been teleported into the Wildlands, he had been so severely injured that his cultivation base had dropped to the Qi Condensation level. Then this matriarchal tribe captured him, and the leader laid a restrictive spell onto him, making it impossible for his cultivation base to recover. Furthermore, because he was a cultivator, they viewed him with great importance, and made him a reproductive slave of the tribe…. He had worked so hard at his job that he was slowly drained empty and driven to despair. It was made worse by the fact that the savage women were extremely ugly, and very rough. At the same time, the savage men were extremely jealous of him. Master God-Diviner had a hard time not collapsing mentally. If it weren’t for the fact that he had divined that someone would come and save him, he might have killed himself. 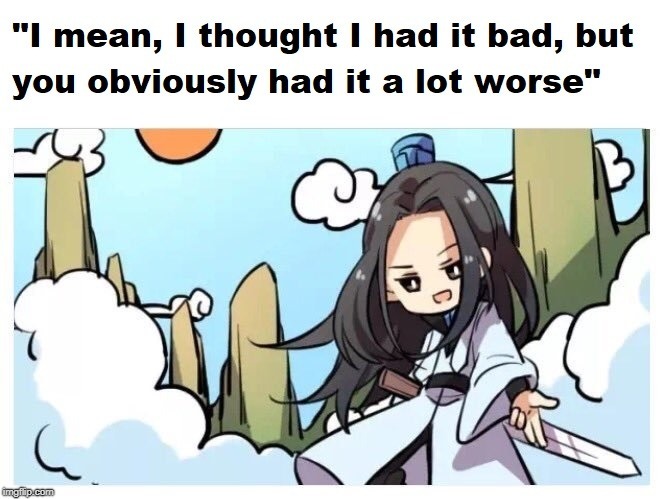 And it was finally here on this day that he saw Bai Xiaochun and Song Que again, both of whom were clearly doing much better than him. Song Que’s jaw dropped in response to what Master God-Diviner had just said, and soon, feelings of sympathy rose up within him. As for Bai Xiaochun, he suddenly realized that compared to Master God-Diviner, he didn’t have it very bad at all. When it came to being forced, nobody could match what Master God-Diviner had dealt with…. “I understand, Master Snortsnort!” Bai Xiaochun said. Sighing in compassion, he clasped Master God-Diviner’s gaunt shoulder.